Nate, pass this on to the guys, or don’t. But I thought you’d like to know. I was in the Old Shillelagh three blocks from Comerica at the end of the game tonight, and after the last out, a few people were down, but most of us weren’t biting. Y’all walked off the field to applause and cheers and an ovation. Of course we all wanted to see you win. The things you’ve accomplished this year have made the city hungry. But–speaking for myself, my friends, and the people at the Old S–we are so grateful for what you’ve done and the pride you’ve let us see in this city again. When I walk around wearing a hat with the Old English D on it, people that never would have said anything to me before now say, “Go Tigers!” And if y’all can foster that change, I feel like we can honestly find a way to make some more changes happen. I hope that you all are proud. We are so very proud to have this team in this city. We’ve felt that way for over a hundred years now, and that won’t change. As far as this season goes, y’all have given me three t-shirts, a sweatshirt, two hats, two balls, forty-five ticket stubs, four rolls of film, about ten videos, and some of the best memories of my life. Thank you, and thanks to the rest of the team, so very much. Some people think that sports end on the field. Anyone that’s seen what you guys have done for this city knows that it goes far beyond the boundaries of Comerica Park. See y’all at Spring Training. I can’t wait. Thank you so much for these blogs. It’s been a great place to get the view from where you sit, vent, cheer and have a good conversation with fans everywhere. As far as this Tigers team…you guys were outstanding. No, you didnt win the series but I will never forget being at Comerica park and watching you guys run around the field spraying champaing on the crowd! I also won’t forget being at the ALCS final game as you carried Leyland off the field. THOSE are the things that I will cherish as a long time fan who has been waiting for this! And I have no doubt you will be back next year with renewed purpose. I almost already can’t wait for opening day when they raise the pennant!!! God bless and have a great off season with all of your friends and family and come back next year………. Nate, you all did an amazing job this year. I don’t think anyone would have even guessed at the beginning of the season that we’d be sitting here reflecting upon the Tigers having been in the World Series. This year was about reestablishing Detroit’s pride in the Tigers – I think it’s safe to say that both pride and faith have been restored, and we have all of you to thank for that. Baseball is officially back in Detroit. See you Opening Day ’07! Nate, what you and your Tigers teammates have done for fans of Detroit baseball was truly special and awesome, and you all will be remembered for it. You made baseball fun again for fans nationwide. We’re all going to hurt awhile, but years from now, we’re all going to remember just how incredible 2006 was and the guys who made it so. Congratulations on being second best! Hi – Cards fan here. I just got home from the game and celebration and I wanted to take a minute to congratulate the Tigers and their fans on a great season. You did what no one thought you could this season and that is, definitely, worth bragging about. While, yes, some errors were made on the side of the Tigers in the World Series, I still think the Tigers are a great team with a rich history. Yeah, maybe they didn’t win the World Series, but they DID have a winning season, they DID win the ALDS and they DID win the ALCS. Those are not small accomplishments and you can relish in the fact that you beat the Yankees. Congratulations again and I’m 100% confident that you’ll take the winning record with you to the 2007 season. Hello, I’m a lifetime (1970 on) Cards fan, and I know (from a fans side of course) the felling of loosing a WS (’85, ’87, ’04). I wish more people could appreciate what it takes to get there. It seems like everyone talks about how great it is for teams to just get to the WS, until they loose the WS. Don’t listen to the negative. The Tigers deserved better, and if they had played any other NL team than the Cards, I’d have been pulling for the Tigers. The Tigers proved better than the Yankees (yeah) and the A’s and all other AL teams. You guys have a ton of young tallent, a superb manager, a group of great vets and are a class act team. Appreciate what you did as a team this year, build, learn, and come back and take it. Good luck in your comming seasons, and if the Cards don’t make it back, I’m on your bandwagon! You and the club have absolutely nothing to be ashamed about. You brought back something to Detroit in which I never thought I would see in recent years- you fellas brought tiger pride back to Detroit. And it has been a memorable summer watching you guys day in and day out- through the ups and through the downs of it all. As much I wish we could keep the whole line up as is, I know some of you guys won’t be around next year. But I hope you each one of you carries a piece of this summer with you for the rest of your careers and that it means as much to you as it did to us. Bless you boys, and now no matter where you play, you will always be considered a Tiger by Detroit fans. PS- Gum time better be back next year!!! Congratualtions to you and your team. You outplayed us. Mr. Leyland had been saying that the Cards had injuries all season and should have had 90 plus wins in the regular season. Thanx for the kind words. YOU ARE A CHAMP!! I think the long wait for the WS to start did take the edge off the Tigers’ roll, but gave Zumaya and Casey time to recover from their injuries, and the weather made it bad for both teams. For our Tigers’ pitchers that had, what was it, only 5-errors in the regular season, well, most of you guys are young and that was just the WS Jinx, tension, nerves, waiting, the weather, etc. No big deal, you all wil be back next year and the next and next. Just look what you all did to the Yankees and A’s!! We’ll never forget that!! You guys are very good, yes indeed. I hope the Tigers’ management signs Casey, the Mighty Casey at bat, as I saw his post game interview and it was seen and remarked he had tears in his eyes, and he played his best and that was GREAT, and has quite a heart and is a good guy to have around. With him and Shelton and Thames etc. altertnating between DH and playing a position I think that the Tigers have good talent in depth. Same for Gomez, Infante and Santiago. I saw Granderson somewhat blaming himself for missing that ball, and it wasn’t his fault with the field being as wet as it was. I understand there was some standing water in spots. I also heard that he was wearing longer spikes, and I think that is a mistake in very soft ground, and you could see the large clod of sod that was thrown up in the air. Lucky he didn’t hurt his ankle. So, all in all it was not Granderson’s fault at all, but the misreable weather and field conditions. Same for Monroe’s missed catch, a bit dryer ground and there most likely would have been a catch. The Cards were also a bit nervous tonight. Eckstein was great though, another WS Veteran. Weaver was also great tonight. Have to give credit for battling like that. Pujols made an unbelieveable catch and prone throw to first, very good!! So to Nate and ALL the TIGERS, you guys had a great season and brought baseball back to Detroit with a bang, and some BLC Gum pops!! You are all Veterans now of a long WINNING campaign and finsihed 2nd best in the Bigs, but to us YOU ARE NUMBER ONE!! You also brought back some childhood memories for me of playing ‘sandlot’ ball with the other kids in the neighborhood, except the ‘sandlot’ was a schoolyard diamond composed of packed clayey earth with gravel and broken glass and other impedimentia. %-) Ouch!! But we had some good times what to me now seems ages ago. Thanx also for those memories of friends from long ago. ROLL BABY ROLL!!! GO TIGERS GO!!! You mean a nice rattlesnake hasn’t found you yet?? Ever see anyone get bit by one?? Probably not I suspect, because you sound as if you are about 5-years old. Great season Nate. This was my first time experiencing a competitive Tiger team, and I gotta tell ya I’ll always remember it for the rest of my life. So many magical moments, one after another. Just an amazing year, finish not withstanding. Wanted to give you some food for thought too here. If you recall 2 years ago in the 2004 World Series, the Cardinals got back there for the 1st time since 87, and promptly got swept by Boston. Now here they are 2 years later celebrating a title. Maybe we’ll be like them soon, celebrating a title of our own. ’35 ’45 ’68 ’84 ’07 ’08 ’09 ’10 etc.! Having got so far, I know that coming second must stick in the throat, but let me give you and the rest of the team a message from Tigers fans all over Great Britain (and there are a lot of them). Thanks for what was, quite simply, a magical season. Who, at the start of the season, would have guessed that the Detroit Tigers would have been playing in the World Series? Precious few, including Tigers fans! From this side of the Atlantic it was great listening to the team battling and winning (thanks WXYT and the internet!). I’ve been a Tigers fan since 1983 and I suffered, like all Tigers fans, through 2003 so how good was it to see the pitching staff show all the talent they’d been touted as having and propel the team to a wonderful season. The big question now is what am I going to do until April?? Nate, I hope you and the team have a good off season and I can’t wait for next season. Detroit Tigers baseball is back! Go Get ‘Em Tigers in 2007! Thank you for a great season. I have been a Tiger fan forever. In the last few years people would tease me about it. I would tell them that some year they will win again. You guys did it this year! Thank you again. I am a die hard Cardinal fan and I know how coming this far and losing hurts like ****. Because it was my team in 04 who had the destinction of ending the Red Sox curse. I know this is hard to hear right now but do not forget you guys are the American League Champs. No one can take that away from you. My final piece of wisdom is to let yourselves feel this World Series loss if only for the reason that WHEN you all win your next World title that it may be even sweeter for you as this one is for us. I hope in some way that helped and remember spring training is a little over 4 months away good luck next season. Nate, Its a hard pill to swallow the fact that the season is over. When you guys beat the A’s, I was home alone. My 2 boys were at friends houses and the daughter and the wife were gone shopping. Our phone never stopped ringing. They all know I love the game(tigers)and was watching and just wanted to call and share the moment with me. Please pass this on to all the rest of the boys and the skipper too… We are all so very proud of you. You have done so much for the city of Detroit, and all of Michigan. I have seen so many people wearing the old English D and smiling. We fans have nothing but gratitude and pride in our team. This tigers fan has had the best summer. I’m only sad that I won’t get to see you all play for 4 whole months. So.. enjoy your break, feel pride in all that you have accomplished (not just the wins but in uniting this city and giving us hope again. )My 7 year old hopes to collect more autographs next year. He is even doing his bedroom in a Tigers theme. We might even plan a trip out to Lakeland to see you all. Rest up, enjoy time with your family and know that you all live in our hearts and we wait for April 2nd to show you our support all over again. Go Tigers!!! Thank you guys for bringing the life back in to the city. We have all been with the team through the down times, and I know I speak for all the life long tigers fans when I say thank you guys from the bottom of my heart. GREAT JOB to you all. See you on opening day! Thank you for a wonderful season Nate. This hurts for now, but you guys definitely surpassed all expectations, and turned the 2006 season into a magical one. One that I know I’ll never forget. We’re very proud of all you guys. I hope you and all the rest of the Tigers will continue to hold your heads high after you reflect on the season. Sure there were a lot of errors in the WS, but look at how young and inexperienced many of the players are! I will be looking forward to Spring Training and the ’07 season. I hope you’ll not only continue to have gum time, but that you’ll do the blogs again. I love to read about the game from your perspective. I hope you all get to enjoy your time off and get yourselves refreshed and ready for a new season. I wish you and all the guys all the best! Good job to all of you. Thank you for this year. Its been so fun watching and I cant believe its over that quick. You guys worked so hard last night. But it just couldent get through. Im expecting another world series next year,and i hope next year will be as good as this. Beating the yankees was a phenomenon and the Athletics too. Those white sox were kinda good but we still made it through. Im hoping to see ll the same players next year for this tigers team. I dont want any of you to leave. But Good luck next year, and so fourth, I love you nate and all the other players. Nate- as a die hard Mets fan and just having gone through this ourselves, but also was rooting for the Tigers, this is “deja vous all over again”. You have everything to be proud of, you played like warriors and you have provided your fans with some fun and good ole fashioned rivalry well beyond the regular season. How much more can you ask for? It all comes down to how the moons align, how the wind blows and who happens to have the streak going for them during the 7 game World Series. Season records mean little except being the factor that got you there. After that it is all bets are off and you play as equals. You played your hearts out and Tiger fans know that. Rest, proudly proclaim that you made it to the World Series and I am sure Tiger fans will count every moment till Spring training and they can root for you all over again. Us Mets fans feel the same about our guys and are thankful for an exciting post season. Nate, CONGRATS!!!!!!! Thank you soooooooo much for the season that you guys had! It was AWESOME!!!!!!!!! I only wish it were April so we don’t have to wait that long, but I guess we all need this break from baseball! But seriously, you guys should be very proud of what you did this year. From last place to first in 3 years is pretty awesome! I felt like I wanted to say something insightful, that no one else has said, but everyone’s pretty much said it time and time again! Nate – thanks to you and all the other guys for a great season. I was at Game 4 of both the ALDS and the ALCS and they were two of my top sports experiences ever! Congrats to the American League Champs and I can’t wait until spring training and Opening Day 2007. THANK YOU!!!!!!!! for a fantastic season. Is it April yet????? I just wanted to say that I have never had this much fun watching baseball. I grew up in Michigan playing softball for the first half of my life and was a huge Tigers fan but got bored with it and instead watched Barry Sanders, “The Bad Boys”, and the Red Wings. Then I moved to Chicago and watched the White Sox win the world series, I had forgotten how watching baseball could be fun. 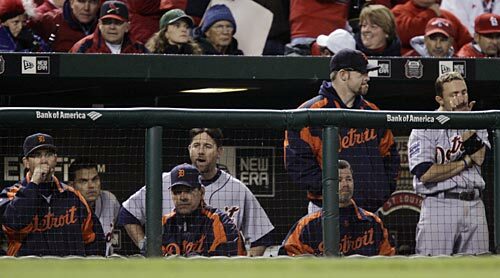 When this season started I knew what the Tigers record was in ’03 but I still watched and I watched and I watched. Watching you guys was addicting from the first month and it only got better as the season went on. I loved the energy and humility that you guys played with. I have finally stopped crying about last night but I just wanted you and the boys to know that you brought back the excitment of watching baseball for me and now I am here to stay. I love knowing everyone’s names and stats and I hope that everyone comes back for next season. You guys went above and beyond everyone’s expectations this year and should be very proud of what you’ve accomplished, you kept a 200 million dollar team out of the world series! Congrats, I love you guys, and have a great off-seaon. You all had an excellent season and don’t beat yourself up over it. I have a feeling you all will be back to defend the AL next year. The team has come so far and no one even picked you to get in the playoffs, let alone winning the ALDS then the ALCS. YOU ALL DID GREAT!!!!! Be proud of all you accomplished this year, take some time to relax and get ready for next Spring. Please pass my thanks and congatulations on to the entire team for a great and memorable season. It was an unfortunate end to the season that we lost the series but you all have given us so many memories and so much hope that the loss, while disappointing, does not dimminish or discount what you accomplished in the season, or the happiness that you brought to so many people. This was my fourth season as a season ticket holder and having gone through the tough times of 2003, I can safely say that what you did this season wipes away the memories of those struggles and replaces it with hope and anticipation for only good things to come. To me, this season was my release from the uncertain times in which we live right now. Going to the park and watching all of you play in the regular and post-season helped to wipe away my worries and I will always be grateful to all of you for that and will always remember this magical season. I can’t wait until next season! Good luck to you and the team always. Thank you for giving us Tiger fans one heck of a year of baseball. What you boys have done for this sport in this city is nothing short of amazing. While you may not be world champs in the eyes of most of the baseball world, you guys are champions in the eyes of all us Tiger fans. I have fallen in love with each and every one of you, you are all true heroes to me. Have a fantastic off-season and i look forward to what next season may bring. Thank you sooo much for such a great season. I wish we would have made it all the way also, but we didn’t so we’ll get them soon–maybe in ’07! Gum Time has been fun this year,your amazing pitching, the hitting, the other pitching, ooohh there are soo many memories, so Thank You for the season of my life! Nate, wow what a year you guys had, and what you have built can only get stronger. This World Series for me a Cardinal fan is the ultimate, been waiting 24 years for this, an trust me it’s sweet. But having the Michigan connection that I do, all of my friends being from there and being diehard Tigers fans, I got to know your team, and followed you guys very closley, so I know what your capable of. So form one Wichata Kansan to another, Good luck next year, I’ll be watching. I was just reading the roster for the tigers and i was reading the birthdays of all you tigers players and it said jeremy bonderman was born 10/28/82…..Then i was like omg today is 10/28! Well i wish him a happy birthday and please tell him that for me. Thanks for a wonderful year and all the wonderful memories i love you nate and all the other tigers, i cant wait till opening day. But anyways by brother was born on opening day! he will be 15 when you play your first game of the season. he also likes the tigers to and his favorite player in curtis granderson. Well i cant wait for opening day im gonna miss the tigers so much. Im gonna miss watching the pregame at 6:30 pm on channel 13 (FSN),and the two funny announcers, Mario Impemba and Rod allen, they were so funny and i love those announcers. Well its just so hard to believe the seasons over,but thanks for this unforgetable season. My favorite moments were when Joel Zumaya got his record pitch speed of 103mph. and when polanco caught the ball where he hurt his shoulder and couldent play for a while ( i missed him so much) and when you guys got that 17 pointer game and also the 18 pointer game, they were amazing.I also loved how magglio hit that walk off home run to get to the world series. I loved every moment. From strikeouts,to popups to home runs. It was great. You guys put the ’03 season behind and looked forword. Dont look back just keep going. Gum time was one of my favorites also. Going to the game in the middle of the summer at comerica was soo fun. you played the twins. but you lost 2-4. It was still good. Ill never forget that. Yes, i have to admitt, i did cry last night. this morning to when i read your blog post and everyone elses and also my other post. Im REALLY hoping to see the same players next year. I really dont want anyone to leave. Jim leyland was fun seeing this year and he is an amazing coach. Thank you for this season and the mant more seasons to come!!!!!!!! i love you and all the other tigers player sooooooo much!!!!!!!!!!!! GOOOOOOOO TIGERS!!!!!!!!!!!!!!! We love you you and the Tigers. We’ll see you next year! This year was magical. Who’s my Tiger? The entire team! I loved not knowing who was going to be the hero/star each game. And Gum Time was a bonus. Can’t wait for 2007. You guys are amazing! Wow, what a season! Everyone should be proud of their efforts this year and that they are not only part of a great team, but a great extended family as well. Everyone I know is already excited for next year. Thank you for all your hard work and for showing your fans the true teamwork you showed this year. We are all so proud of you guys! Congratulations guys. I was sitting at home watching the last two games and I could barely sleep after both. But this morning I woke up with a smile on my face. Why?…You guys were in the World Series, you beat the Yankees in the playoff series I’ve waited my whole life for, and I had seen countless moments of baseball that I will never forget at CoAmerica this year. This was all more than I had ever expected before this year started. As you guys started to win…you started to see the diverse personalities on this team. It was always a riot to watch the pitching staff on TV, because you guys were having fun, and so were we. I really don’t know for sure what goes on, but to me…it looked like you young guys taught Kenny how to have fun with baseball again, and in turn he helped your pitching mature. I just can’t remember ever seeing a more likeable team than our hometown Tigers this year. I can’t wait to be at opening day again next year (hopefully I can get tickets…it might be even harder than usual). Good luck next year…we’re all exstatically proud of you for what you’ve given us all this year. I find great consolation in those words. If you are a person of faith, which I believe Nate is, and I know several of the other Tigers are, then you will be able to appreciate the bigger picture and that is God does His will in His time, not in our time. Thank God for the unforgettable summer and Nate, thank you for taking the time to blog. Hope you all have a wonderful off season and thanks for the memories of this season. what an amazing season. thank you tigers, for one of the best summers of my life.. i rediscovered baseball and had more fun going to games at comerica park than i have had doing anything else in a loooong time. you have made me a fan for life. what a great group. the champagne celebration with the fans (i was there!) at comerica was one of the greatest things i have witnessed in sports in my life. what a special group, from top to bottom. we love you and are SO proud of you! you brought baseball back to detroit! THANK YOU FOR ALL THE GREAT TIMES THIS YEAR! CONGRATULATIONS 2006 AMERICAN LEAGUE CHAMPIONS! GO GET EM NEXT YEAR! can’t wait till spring training and we’ll see you on opening day! To you and all the Tigers — thanks! You have become dear to so many of us Tiger fans, and you’ve given us a season to remember. I’ve enjoyed not only following the games, but reading your insights and viewpoint on this blog. Great job! Thanks for everything, and God bless you. I’ve read all the comments about the amazing year that the Tigers had, and I agree. However, I would like to share my one observation that no one else has hit upon. While watching you guys play this year, I noticed how you cheered each other on, how supportive you were of each other. There was a party in the dugout every time someone did something good and there were consoling pats on the backs and pep talks when it wasn’t so good. In contrast, for example, the Yankees during the AL chase – camera on the dugout after a good hit, etc., high fives and that was the end of it. There were no parties, no rooting for each other, major disconnect. The Tigers, on the other hand, were a team, you bonded and were all in this together. Now that’s the way baseball should be played. That’s why they’re called teams. Jim did a fantastic job of pulling you guys together and you guys did an even better job of staying together. As a lifelong Tiger fan, I am so proud of my Tigers, through good and not so good. Congratulations on an amazing season, thank you for the thrills and anxiously awaiting Spring 2007. Have a good vacation! Since becoming a fan of the English “D” in the early 60’s, when the local little league organization bused us to the game every year, I have a deep appreciation for the teams effort. The experience gained from this years efforts will only increase our chances at a championship ring in 2007. I am quite sure that 2007 season will be just as exciting as 2006. Thank you and the Tiger organization for another great season. It is so much fun watching men play a kids game. You guys played great. I want to congratulate you and the rest of the Tigers for giving us one **** of a season. You and the rest of the “Boys of Summer” were nothing less than a class act. I’m a life long Tiger fan and have always bled orange and blue from mid-February to September. This year it was a whole month longer and somehow, winter will seem a bit less harsh because baseball will be coming sooner. Congratulations to you, your team mates, Mr. Leyland and his staff for giving us one spectacular year. I’m hoping I’ll be able to afford a partial season tickets package this year and I’ll see you on April 2nd – Opening Day for 2007. I am surprised by what an impact this team has had. A year ago, I could not have named more than ten players on the team’s roster, now my 2 year old son runs around with a Joel Zumaya T-shirt saying “Magglio Ordonez” when the game is on TV and my 7 year old daughter swoons when she sees Sean Casey. This team reminded me how great the game of baseball is. The Old English D has another notch in its storied past. Win or lose from this point forward, every one on the 2006 Detroit Tigers will be remembered for many years as a champion. Thanks for a terrific season. I grew up watching the Tigers with my grandfather and now I watch with my grandchildren. You guys were absolutely awesome this year and so much fun to watch. It was a sad ending to a great season but you’ll be back. You’ll always be #1 in my book. See you in the spring, I can’t wait. GO TIGERS!!! Congratulations on a wonderful season, we are all so proud of the Tigers! In the beginning of the season, we just wanted the team to make it to 500 and here you were in the World Series, what an accomplishment! So you didn’t win the title, you’ll get them next year. You all should be proud of yourselves, you brought the old English D back to not only the city of Detroit but all of Michigan and the U.S. too. Last year my mom didn’t know one name on the team, now she knows them all. I’ve been a fan since 1984 and in years past, I was afraid to wear my English D’s but not anymore. Let Justin know that he pitched an exceptionally good game last night. Besides the 1st inning and the error, he did well and he shouldn’t be down on himself. He had a remarkable season and he will only get better. Everyone had errors in this World Series, you live and learn by it. Also tell Todd Jones that he has a true fan here. I don’t understand why people get on his case. He’s a good guy, with a heart of gold. He makes me laugh everytime I see an interview of him. Nate, I love your gum time and your comments. I hope it continues next year and will be looking forward to it. You are a great pitcher and a down to earth one at that too, I like that. To the rest of the team, congratulations on the best season I have seen in a long time! You guys are great and you’ll get them next year! To Mr. Leyland, I am absolutely speechless when it comes to you because you are just totally awesome! When we second guess you and think you are crazy, you pull through. It’s almost like you are God, it’s very scary! You’re the best Mr. Leyland! Congratulations Detroit Tigers, go get them next year!!! Wow Nate, what a season huh? As a friend of yours, it has been awesome me, Deb and Kevin watching you all year. I’ll tell ya pal you have brought us a ton of excitement this year. I am honored to call you my friend. Hope to see you over the next couple months!!! God bless you and Christine. Its the next day, and like many fans I am still reeling that the series went the way it did. I’m sure you know the feeling. Having said that though, there are such greater emotions running through me that I am having a hard time getting them out. You guys have touched our hearts in so many ways. There was so much magic the entire season. I have always had a deep passion for the game, and you guys helped me find it and rekindle it and nurture it yet again. I will never forget that. We made it to 4 playoff games- me and my 2 boys, who are now 18 and 20. The Tigers won all 4 of the games. We saw both of the home games against the Yankees- the two most memorable sporting events I have ever attended. We saw the first home game against the A’s, and we saw our lone victory against the Cardinals. To get to that game we had to buy standing room only tickets from a broker, at about $250 each. Then we had to show up 3 hours before game time to get a good place to stand, and we had to stand through the cold and the drizzle. And we would do that all over again- it was worth every penny. Every time we went to a playoff game, we wanted to go to the next one. So thank you for such a great season, and you all the joy you brought. You made my year, and I will never forget that. I don’t care what happened in St. Louis. In my heart, you guys are still the best. I wish you all the best in the off-season, and I am already looking forward to next year. Thank you for this great 2006 season! You cannot begin to know just how much this has meant to all of us fans. Will there be a 2006 highlights DVD produced? Please?? Can’t afford partial season tickets or even to go to many games, but I am already planning to be at Opening Day to see all of my Tigers at Comerica as the American League Pennant is unfurled and the 2007 season begins. GO TIGERS! P.S. What in the world am I supposed to do these next few months with no Tiger baseball to watch????? Thanks Nate. Thanks for EVERYTHING you and the Tigers gave back to the fans this year. I can honestly say I have been a lifelong Tiger’s fan, and I have been through so much misery with this team over the years. But that is what makes the good times even better. It’s getting through the tough times, taking the losses in stride, living to fight another day. I thought your post season performances this year were GREAT! You gave your heart and soul for this team out there and I know this Tiger fan appreciates your effort. Take this WS loss, let it soak in, embrace it…then let’s go get ’em next year and prove that the Pride is back in the Olde English D! So I may be a Cardinals fan, but I have to say that y’all Tigers played a heck of a game. It’s amazing how y’all bounced back from last year, and I wish you the best of luck in the next season. and hopefully to see you play in those parks. I’m not to interested in watching the other local teams in metro Detroit so I will be keeping my eye on the Tigers in the off season and gettting pumped up for next year. Have a great winter and we will see you next spring. Nate – thank you and all the Tigers so much for a great season… AL CHAMPS! The World Series! Who would have thought that was possible at the beginning of the season? We’re all so proud of what guys have done for yourselves, and for us fans this year. Please hold your heads high – I’ll be proudly displaying the “D” here in Seattle and when you come out to play I’ll be there to cheer you on. I can’t wait for ’07 – when do you have to report? *grin* Have a great rest until then – you all deserve it. Hey – thanks also for sharing your thoughts here, and please keep blogging in the offseason. We’d love to hear what you’re up to. Hey Nate: You guys exceeded my expectations in a big way! Thank you. I’ve always worn Tiger shirts, jackets, hats, etc., here in Ohio. Now I can wear them with a swagger in my step. Please keep these blogs up during the off season. I will need my Tiger fix! You guys will go far in the years to come. You have the WS experience under your belts. I Love you all! Go Tigers! Nate, I would like to thank you and the rest of the team for an incredible year. I grew up in Detroit and now live in California. I have remained a Tiger fan for 40 years and often fly back to Detroit for games. I flew back for W.S. games one and two with my 16 year old daughter. The memories you guys have given us this year will never be forgotten. Once again, thank you and the team for what you have done for the fans and the city of DETROIT !!!!!!!!!!!!!! Cards fan here-I just wanted to congratulate the Detroit Tigers for an amazing season! You guys were really awesome and were a very worthy opponents for the St. Louis Cardinals. I hope you guys have a nice off-season. You guys deserve so much credit! And a message to the fans, you guys are crazy! You guys gave Kenny Rogers so much inspiration when he was out there and that was AMAZING! There should be a battle of the fans! Well, once again, congratulations on a great season! God Bless boys! Thanks to you and the Tiger team for an AWESOME season. You guys are an amazing team. You guys have brought so much pride and happiness back to Motown. THANK YOU THANK YOU THANK YOU!!!! I can’t wait till next seaon. We are a baseball loving family, and it is going to be a long winter waiting for our MUCH LOVED and ADMIRED team to return. Enjoy your time off, and we will see you in the Spring. Thank you for the great season. You guys had an unbelievable year, and I cannot wait to see how it will go next year. Yes, there is disappointment from the World Series, but what a great accomplishment in getting there! The last time the Tigers were in the World Series I was two so this was an awesome experience. Thanks for allowing us to care about baseball past August and even through October. You guys are number one in my book. Can we get MLB to move spring training up to december?? Nate – thank you and all the Tigers for some great, great memories. I’ve never enjoyed a season of baseball like this one. You all were awesome. Like the others, I’m really looking forward to next year. The whole Tiger organization has our deepest admiration and thanks. Please pass it on. Great Job this season. I enjoyed watching you all this year. Hope to see you guys next year and to see another trip to the World Series! Nate, We want to thank you guys for such an amazing season. It was so much fun to watch all of you, you are the epitome of team. We loved to watch you pitch, Nate and you were so good throughout the entire regular season and playoffs. We will never forget you striking out the side after allowing runners on second and third against Oakland -we always thought you could get out of any jam 🙂 -, or Magg’s homerun to put us into the world series, or Kenny throwing 23 scoreless innings, or beating the Yankees when nobody thought you could. We loved watching you stuff your mouth with a “rally chew”. We watched the debut of Gum Time and were laughing the whole time. You guys made this the best summer ever and showed how baseball should be played. We hope you all have a good off season, and we will be counting the days till spring training. We have enjoyed reading your posts so much and we hope you will continue it next season. We went to a couple games this year and we saw you pitch against Seattle on Labor Day. (You were amazing!) We can’t wait to go to the park next year. I am a Cards fan but I wanted to say my hats off to your team and city for being american league champions. You have an outstanding team with a great manager. Your time to win a World Series is just around the corner. Please hold your heads up high and be proud of all that you accomplished this year. Thank you Nate for a great season. All you guys provided an opportunity for me to share many special moments with my 4 boys. We talked Tigers, watched Tigers, and were able to get to many of the playoff games. It will be a season they will all remember. We can’t wait to see you all back in the Sping. Thanks again. it was the most magical ride of a lifetime and having taken that ride with you guys made it all worthwhile! thanks so much TIGERS and MR. LEYLAND for giving us the most amazing season ever and thanks so much NATE for always keeping the faith alive no matter what. you guys are the best! take good care of yourselves and God bless. Hi Nate, as a lifelong Tiger fan, I just want to pass on my congratulations to you and the entire team. You have brought so much pride back to this city. The accomplishments the Tigers have made this year are just incredible to say the least and I hope all of you savor them in the off-season. I know I will and will be flying my Tiger flag throughout the winter looking forward to a wonderful 2007 season. I only wish we were able to have an appreciation parade for you guys, because you all are certainly deserving of it. Have a restful off-season and enjoy all the praise that comes your way. “Leyland for Govenor”. I’ve been following the Tiger’s since I was about six years old. I got to go to Tiger’s stadium a couple of times and then my father in the air force was relocated when i was nine (1999). The first time I got to come back to Detroit ( I had been out of the loop for a while ) was 2003. I went and saw the Tigers play the Twins. It was a close game but we lost the pitching duel th final score was something like 3-1 or 3-2. My father was relocated again in Virginia this time and this is the first year I got the MLB.TV package and I couldn’t have picked a better time. I’m one of those people that look for small improvements, you know take it one step at a time, so I was looking for about a .500 season. Instead I ended up with a 2006 AL Champions hat. I just want to say thank you and all of the Tigers and Leyland. I was always on the verge of tears when the seasons ended and I had to say “There’s always next year.” This is the first year I didn’t have to say that. I have never been a baseball fan, that is, until this year. Wow, like someone else mentioned — I started watching and got hooked like an addict. The players were respectful of one another and the game, but yet, appeared to really enjoy being a team. All of this, plus knowing that with each game, another win was very possible, made watching alot of fun! Have a great vacation and rest up for next year! I just wanted to say thanks for the exciting season of baseball . I am so proud of all of you . Don’t hang your heads . I am looking forward to watching you guys next season already , I believe you guys are good enough to win the whole thing . Secondly , congratulations to the St.Louis Cardinals . The Cardinals are a class act . I still wish you guy’s lost ! Thanks again Detroit Tigers , enjoy your break and the best of luck next season . Congratulations on an extraordinary season for your team, and especially for that great game 1 of the ALCS that you pitched. We are very proud of our ex-Manatee and wish you all the best in 2007. We hope to visit you in Lakeland next spring. Now please enjoy a well-deserved break! Your fans aren’t dissapointed. The Roar never left, and it never will. It just got louder from Detroit through all of Michigan. Thanks for making me a baseball fan. Fact is, the deserving team one. They played better. The fact that you guys know that and accept your faults and don’t blame anyone else just make me an even stronger fan than if you would have actually won the series. Thanks for making it to the world series, and I’m sure it won’t be much longer until you are back there. No matter what, I as well as thousands of others will be there cheering you on. how bout we rent space at ford field every tuesday and play some games against the mudhens? Nate, and to all of the Tigers. We are all so very proud of you guys, your are a team that is a real class act. I either went or watched every single game since the end fo May only missing one because I was out of town on business. You have made this summer one to remember around here and a lot of people proud to call themselves Detroit Tigers Fans. I was able to go two the two games against New York. I have been to a lot os sporting events and I don’t think that I have ever been to anything so memorable. It brings a smile to my face just thinking about it, and Magglio’s walk off homerun same thing. You guys are terrific, and I cannot wait until spring. Well let me just say Im sooo proud of what you guys have done this year… this season has been unbelieveable!!! We haven’t had this much to cheer about in years. all of what you guys accomplished. Going to the playoffs and dominating The Yankees & The A’s unreal!!! Im so looking forward to next season I can’t wait we will def be better then ever!! Man what a year! I also did not get down after the last out like I thought I would. I was just really really proud of all you guys. We have a great team and y’all are a blast to watch on TV or listen to on the radio. I will take away so many summer memories from this season, just tell the team thank you for a great ride. From everybody here in Toledo, thanks so much and let’s go get the ring next year ! You all should be very proud of your hard work and efforts. I will wear my Tigers teeshirts and hats proudly even when the fanfare has died down come mid-November because wearing it shows immense pride for a team that is relentless with hard work, “never say die” attitude, and who is FIRST CLASS ALL THE WAY! I would imagine that some of you feel like you let this town down, but please know that this feeling does NOT extend beyond your clubhouse. The entire state of Michigan is more proud of you than you will ever know. The 2006 Detroit Tigers team should walk tall and proudly and relish in the accomplishments that you have achieved and think about the thousands of young kids that want to walk in your footsteps someday. You all have been super role models for our youth and we parents are grateful. I can’t wait to see what next year brings us. I saw my first Tiger game Sept.21, 1963.A significant game for other reasons, too. Have seen or heard or read the box in the paper since then most every game. Does anyone really think Charlie Dressen,Billy Martin, Ralph Houck or Sparky Anderson would have EVER hugged the opposing manager in the World Series?? And would Leo Durocher let it slide if he thought a pitcher loaded a ball? Did Mayo Smith “save” his best series pitcher so he would get his rest for Tiger Stadium? I’m sorry, but this series wasn’t much different for me than the one where the Giants had the kiddies frolicing about in the dugout! Baseball shouldn’t become an “encounter group”. I never thought I would miss Eddie Stanky! You guys are one of the best in the Game! You all put your heart and soul into it but I guess it just wasnt your year. yeah Leyland is just a terrible manager for hugging Larussa…..It discredits everything he’s done…What do they think this is…football? Man, what the **** are you talking about?!?!? Billy Martin? I liked him but he was just a nutty bag of emotions most of the time wasn’t he? Give me hugs anytime over watching him and steinbrenner go through the joke of a soap opera they performed!! Anyway thanks for your neagtivity it’s been so cheery and “chin up” in this blog we needed some angst and we stink talk to balance it out!!!!!! You know thers a blog for poor losers somewhere… go find it!!! As a matter of fact give up on the tigers and dont go to any games…we need the seats for real fans!!!!!! To anyone else that wants to trash this team….I will respond and make you look like a ***** as well!!!!! This is not the time place or forum for that and as a Tigers diehard I won’t let it go on without trashing YOU! Anyone who’s with me on it please pipe in! by the way…am I heartbroken at the loss…yes. Am I angry at the way they played in the series. Yes. The Tigers players are all expressing that they know they did not play well enough to win. But for us as fans to be there for them and call ourselves “fans” as they kill the yankees and A’s and then turn tail when they lose…thats an embarrasment to the tigers and their fans….Have a little more pride and respect,***** it up and show up opening day…. All I can say is this has been the greatest Tigers season in years. You guys play as team and act like a team That is awsome. I don’t really give a dam what others says. The Tigers will be a team to recon with from now on. I heard some trash talk today. Basically that always happens. But your all stll AL CHAMPS!Who knew that would happen opening day. Teams that don’t work together never get that far.You all made it to the World Series..and that is awsome. You can tell the Team for me I am really proud of all the accomplishments. I expect big things next year. Nate thanks for sharing this with all of us its great to read it from your presective as a player. You Rock!! !So do the Tigers all of them!! My niece, 13 and nephew, 20 could understand for the first time in their lives why I always said Tiger playoff baseball is special. I’ve always said that experiencing a World Series with your home team is something you will never forget. Thank you for giving the younger Tiger fans this experience. The day the Tigers won the American League Champion Series, I had a house full of people from age 12 to 84 all with one thing in common, our beloved Tigers. How sweet is that??? One more and I’ll stop this little rant! It is unfathomable how ANY Tigers fan can bash Jim Leyland! The man gave everthing he had this year to work with these guys and give us a winner. How many cities would give up anything to get him? How many cities have managers that are just punching the clock and collecting the check? When I went to the ALCS games I saw Leyland walking around in the outfield talking to his players and hitting balls to them…I didn’t see Joe Torre out there!!! The man is thinking about ways to improve spring training next year as the world series is going on!!!! He obviously has his heart and soul into this and NEVER stops thinking of how to improve this ballclub. And all the talk about game 5 pitching…It wouldn’t have been question if the tigers had scored some more runs and committed less errors. The lack of offense and defense is why they lost not because Rogers did not pitch..
By the way I would of agreed with Leyland if he sent his daughter out there for game 5 the guy knows this team and baseball better than any fan ever would so when it comes to game five second guessing…DROP IT!!!!!! Great WS. Grats to you and the whole team. You gave the entire state something to get excited about. Better luck next year. Bring back the GUM. Good luck and have a great holidays. I would just like to give thanks to you guys for a wonderful and emotional year in Detroit. We needed Baseball fever back in our blood and we have it now. My girlfriend works for Fox Detroit and has been a fan since the beginning. We cannot wait until we can see you play again! I hope we can be a threat for years to come, And you guys brought a championship to Detroit by beating the Yankees up and down. We are all proud and excited to see the 07 season start! We hope the team stays together. We have a bunch of great guys! Keep it up!! Thank you to you and your teammates for a fantastic year. This season was spectacular and is one I will cherish, I think even more than 1984. The Tigers of 2006 are world champions in my book! See you in the spring! Hi Nate – Thanks to you and the rest of the Tiger team, from the players to the coaching staff and everyone behind the scenes, for giving us the most memorable year in a long time. Through all the ups and downs of years gone by, this year has been such a thrill for me. I have loved baseball since I was a little girl, listening to games on my transistor radio or out on the porch with my dad. Remembering the thrill of the ’68 series and going downtown to celebrate honking our horns and waving our pennants cheering! Even though the World Series was not won here, you guys have won some larger. You’ve won the hearts of true Tigers fans by showing your love for the sport, the cohesiveness with your teamates and having the willingness by working hard and having fun along the way. Thank you for the hope you have given the people in this city and I know I do not speak for myself but of others…. Thanks for this great season and look forward to 2007! Have a great off-season, enjoy your family and friends during this break! I just wanted to say thanks for an absolutely awesome season. Obviously things didn’t exactly work out like you, or me, might have wanted but that’s why the games are played. Over the course of my life I haven’t really seen much winning in Detroit, I’m currently 20, so the last time I saw a winning season I think I was around 6 or 7 and don’t really remember it all that well. This year was nice, I came out to the ball park 8 times this year and hey we won 7 of those so I cannot complain. All I was hoping for before the season was something to cheer for, something to keep me interested the whole season and you guys game me that and more. I think I only missed watching a few games all year, which my girlfriend might not have appreciated too much at the start but now she just as diehard as I am. She knows your the one with the glasses, and Kenny looks like he could be half of your dad’s, and Zoom Zoom brings the heat, and she knows what the infield fly rule is and all that too. Not only did you make your old fans happy and proud at the same time you brought new fans in and I have to say thanks for that. I was looking at your guys attendance the past three or four years earlier and it’s gone from in the 40% range up to near 80% this year which is fantastic. You guys gave hope to a lot of people and transformed my dad from hardened 30-year autoworker to what seemed to be an excited kid during the playoffs, he’s always been a fan he was there is ’68 and ’84. He always told me about the Tiger’s glory days and I wondered at times if I’d ever see those and be able to tell my kids about my Tiger’s glory days. I have to wonder no more, they’re here and I’m sure you guys will make it last for quite the while. In years past once the season was over I’d turn my focus to thw Wings and Pistons but this year you guys gave me something to keep my interest all winter…and hey I’m sure you’re keeping a lot of others interested too. I just seen a poll on ESPN, and 20% of the thousands said the Tigs’ would win it in 2007, quite a difference from this time last year. I want to let you, CMo, Curtis, Maggs, Pudge, Polanco, Guillen, Thames, Casey, Inge, Zoom, Jonsey, Wilfredo, Fernando, Jamie, Grilli, Miner, Verlander, Bondo, Kenny, Maroth, Santiago, Gomez, Vance, Infante, Neifi, and the whole coaching staff us Tiger fans are pround, happy, and looking forward to a successful 2007 season. Thank You. Nate, I want to thank you and all the Tigers for this wonderful season. I drove 3.5 hours to see 14 games at Comerica this season and I don’t regret a single mile on the road. You guys have made the park my home away from home. There’s nowhere else I would rather be on a summer afternoon or evening. My wife and I cried real tears when you finished off the Yankees and again when you swept the A’s. She didn’t even mind when I said that it was the most exciting night of my life when you guys came back out to celebrate with us after the ALDS clincher. We are adopting from China and will soon be going there to get our daughter, Sera. Our paperwork has been there over a year now and we passed the time waiting watching you play. I looked on yesterday’s game with some sadness until I realized why you haven’t won yet. You are waiting for Sera, just like we are. She’ll be at opening day with us, Nate. I feel confident that next year will be the year of the Tiger! I just wanted congratulate you guys on a well played season. You have to be in the World Series to lose it so you did one heck of a job this year! It’s amazing how we have tools like charles bleckner posting stupid comments when you know **** well he probably can’t even throw a ball. Our tigers know whatever they do, we’ll love em, why because we’re diehards. They know they did one helova job, and it’s backed up by hundreds of posts that agree with us, and all of you other fairweather fools, go watch a ping pong competition. P.S. these guys need a parade!!!! I know I’d be there. It has been an incredible year! There is no reason that I can think of for any of you to hang your heads. I have been a 20-Game Season ticket holder since Comerica opened in 2000. My family and I drive over 2-Hours (one-way) from Freeland, Michigan to watch our beloved Tigers. I wanted my kids to become Lifelong Tiger Fans just like their dear old dad. I am happy to say that they are! I have always talked about the great years the Tigers had when I was growing up and as a young adult (’68, ’72, ’84, and ’87). All of you have given my kids a year that they will never forget as long as they live. They will be telling there kids one day about the year that the ’06 Tigers had. To me that’s what it is all about. We were there throughout the season and the playoffs and enjoyed every minute – especially the ALDS (My two favorite teams are the Tigers and anyone who plays the Yankees). As fans, we think of you guys as part of our family and through all the ups and downs of the season, you all have given us so much to remember. We attended Photo-Day and it meant so much to my kids to meet with all of you and of course to have a picture taken with each of you. We all celebrated with you at Comerica when you guys won the ALDS. We all celebrated with you at Comerica when you guys won the ALCS. We celebrated with you at Comerica when the first World Series game was played in 22 years. These are the intangibles that don’t show up in the box score any where. I want to thank you and your teammates and the Tigers organization for an absolutely wonderful year and my family and I will be back in ’07 to enjoy another great season with the Tigers. I think it’s time for you and your teammates to go home and enjoy your time off with your families. Kenny Rogers should have started game 5 and if anyone has any clue on what has been going on the past month and the past week I shouldn’t have to explain it . I just came home from work where everybody has been sick and tired of my Tiger mania for whole season, now they are telling me “I told you so!” I told them, they told me nothing, you guys made it to the world series, that’s fantastic, heck I just wanted you to be the one’s to keep the Yankees from going. Congratulations and thank you so very, very much for a terrific season. Remember that there are people like my kids and I that love the Tigers no matter what, win or lose, for always! Have a great time off, you all deserve a relaxing winter and we will be there in the spring waiting and over anxious for another great year! p.s.I want to appologize for the behavior of the people and athority in Detroit, there should have been a parade waiting for the team when you landed, I can not believe there was nothing! I am so sorry, Michigan is a dreadful place to be a team that does’nt win all of the time. I can not believe all of the fair-weathered-fans around here. And don’t listen to the idiots, they don’t matter anyway. Tigers rock and everybody knows it! Terrific job on the field and in doing the Blog. You and your teammates can hold your heads high and I know you will be back next year for another exciting post-season run. I live in Toronto but have been a Tiger fan since the mid-sixties and have enjoyed this season (from afar) immensely. I hope you and your teammates have a nice break — maybe Manuel can get his annual haircut and Jim Leyland can arrange for that off-season PFP he mentioned last night and we’ll look forward to another great year in ’07. We Cardinal fans truly appreciate your graciousness toward us and toward the Cardinals. When the Cards won the division title, I (and, I’m sure, many other Cardinal fans) was really hoping that if we made it to the World Series, we’d be playing the Tigers, and not just because it was a chance to exorcise the ghosts of 1968. It would be a World Series between two Midwestern teams with great baseball traditions. Furthermore, Cardinal fans still have a great deal of fondness and respect for Jim Leyland and Placido Polanco (wish we could have held onto him). Best of luck to you next year. I have a clue as to what has been going on and I disagree. I am not just a lemming follwing everything Leyland says but I think he knew the situation, felt Kenny would be better suited at home and was playing the odds he thought were best to win the series. After the way he brought the Tigers out of the basement as well as the way he found a way to turn the Tigers from losing 3 straight to the royals to beating the Yanks and A’s in consecutive series….I think he knows how to manage! Besides, If the Tigers had not played such poor defense and offense they would not have been down 3-1..that decision did not lose the series for the tigers bottom line! Anyway I am not going to ponder or argue about that all winter this is the last you’ll hear from me about it. I agree with the decision and I cant wait for Verlander to get another shot to step up for us! I did initially hope for Kenny to pitch game 5 (because I thought maybe he was the only pitcher whose killer instinct was more powerful than his jitters), but that was before I remembered the allegations of cheating and how some Cards fans may have treated him. After the fact, I don’t remember saying that it cost the Tigers the series. The blogger “Clevelandgolfer” said that (see above). Certainly, their constant errors and failure to hit the ball with runners in scoring position did them in (and, frankly, the Cards may have just kept answering run for run anyway, the way they were batting). Does anyone know how much season tickets (say, 21 game packets) cost? I cannot find the prices. Thanks! Thank you so much for a wonderful year. The TIGERS are back baby, and it is great. I have been a fan since I was a little kid, and to see what you guys did this year made things great again. You guys have a great team and you will be strong for years to come. I can’t wait to see you guys right back in there next year. I hope you all have a great off season, happy holidays with friend and family, and I can’t wait till opening day 2007! Thanks again for the wonderful memories, and keep your heads up, you should all be proud! Cleveland golfer should stick to golf. I dont know if you know how to count but we had to win 3 not just 1. So kenny pitching wouldnt have done much. They still had to win 2 at home with verlander pitching then. So to the Bandwagon fans that is so quick to critisize keep it to yourself. Them not winning might have been the best thing to happen. Now these guys will come out with fire and want it more because they were there and didnt get it. PLUS now we will have BIG names that will want to play in D town and have a chance at a championship. One day out and we are already talking about Bonds coming here, Im not saying that he is the answer but that is just the beginning. I think we are going to get some power and more depth in our pitching. If you think they were a good team this season I would say just wait til 07. I am trully sick of the fans being critical when most of these people probably didnt even watch a game before june of this year! The diehard fans are always behind them!! Cleveland golfer is RIGHT ON about Rodgers. He should have pitched!!! Hey-pal, I know how to count too. To count to 3, you go 1-2-3, correct? If you don’t get the 1 first, the 2&3 mean squat. Was there a game 2 at Comerica Sat? Bonds? Let Steinbrenner have that POS. Rodgers said himself he could pitch any day, any place. I have watched this game long enough to know a tweak here and a tweak there guarantees a team NOTHING. The Yankees have the best lineup of all time,right? Rodgers chewed them up and spit them out. He may well never beat Christy Mathewsons’ record now. RODGERS SHOULDA PITCHED,CAPICHE? No there was no game 2 on sat at comerica it would have been game 6 so im not so sure you can count pal. If he did pitch then we just would have suffered a loss at home instead. And all Kennys wins were at HOME not on the road. It makes a difference. So unless he could pitch 3 in a row it means nothing. Let me guess if he came out and blew the game you would probably be ripping him apart for that right? Typical couch coach. I know I’m reflecting……on all the wonderful memories of this summer. My whole summer revolved around Tiger baseball and I loved every minute of it. It’s sort of hard to let go, because I don’t want it to end. Thank you, Nate, for sharing your time with us fans and just playing fantastic baseball. It just doesn’t get much better than this. Hope you enjoy your time off. You certainly deserve it. #1- Kenny Rogers, while the best post season pitcher this year, did not deserve the treatment he would have gotten from the loud minority of Cards fans that bought into Dirtgate. More importantly, such a situation would have soiled the atmosphere. La Russa knew that in Game 2, and Leyland knew it for Game 5. The Cardinals did not deserve to have their good image soiled by a few boisterous fans and the inevitable media feeding frenzy that would have followed. #2- Leyland understands, as should you, that we are building our youngsters up for great careers and cannot afford to send them the mssage that they are worth less than Rogers or anyone else. They were on the active roster and should be expected to perform, at Comerica or elsewhere. Verlander needed his chance to either shine or fall on his own ***, and if you cannot see that his hardship will help him and the Tigers win more games next year, you should not be even trying to follow baseball. #3- Like Jim Leyland said, if you know more than him, you need to be in the dugout and he needs to be watching from the seats. You said yourself, a tweak here and there guarantees nothing- so that means that a Rogers appearance in Game 5 guaranteed nothing as well, right? Every great pitcher is one day away from getting knocked out in the first inning. Just ask Pedro Martinez, Roger Clemens or Tom Glavine. #4- Read the box scores, for God’s sake, and you will see that it was not really pitching, but poor situational baseball that did them in, to include poor fielding decisions/excecution, and a lack of hits when the ducks were on. #5- Screw Mathewson’s record. That just goes to show where your heart is- individual stats. Only a ***** worries about that stuff. After game 4, I posted some unbelievably nasty stuff because I was extremely angry. It was so bad, a fellow blogger accused me of being drunk. I reflected on this and also noticed how genuinely happy Tigers fans were. Nate and the Tigers brought a lot of joy to many in Michigan and elsewhere (see the previous blog from the fellow in SCOTLAND!). I felt so terrible about the stuff I had written, I felt as if I had become a Yankees fan. That’s what you should do- migrate to New York and help Joe Torre manage the team like every other pretentious Yankee fan that thinks they deserve a direct line to Torre’s office. The rest of us will enjoy the rejuvenation of a tradition that quietly survived some really hard years. We refuse to let you make it any harder for us. This is Tiger Nation’s time to celebrate baseball. So, do us a favor and go away. By the way, Tigers fans: This is our chance to build something that trancends winning and losing (although winning is obviously more fun)- we have a chance to build a tradition of support that will help Tigers management attract good players for years to come. Let’s fill those seats and let our gracious visitors know that Comerica Park is TIGER COUNTRY!! Tigers – my heart broke watching the World Series – And it felt so good to FINALLY care again. I was at that game when you finished off the Yankees and I have to say that the party that broke out after that game couldn’t be beat if you’d had won the whole thing. The loss yesterday continued this deep sense of processing that I have done through the lens of our 2006 team… While one of my dad’s favorite memories is dancing with me as a toddler in 1984 after we won the World Series, I was too young to remember. I do, however, remember 1987 and Trammell and Whitaker, and I do remember Cecil Fielder and his 50 home runs, but I do not have many memories of winning very many baseball games. However, the beautiful part of this letter happens now, this past year, up until this moment. Much has happened in my life since the beginning of spring training 2006. As we were beginning the season, typical male blather seemed to fill conversations regarding our team. Many of us continued in skepticism, but some of us had a much more positive outlook on the team. (I, however, was one of the highest of skeptics!) While the story of the Tigers was continuing in spring training, my story was also continuing and taking some sharp turns. (Similar to the Tigers…) I was applying for graduate school, (contemplating leaving Michigan for this graduate school) and we had never been more uncertain of my mom’s health. I remember as the season started off well, I continued in my skepticism, even making bets against our team. (I figured that it would be easy money, and if I lost the bets, I figured that I would be delighted to pay… I suppose that it was probably a protection mechanism of sorts.) While we were beating all of the teams that we were supposed to beat, we were losing to the “good” teams. This was my defense within this community that was forming over our team this year. Every day we would always talk about the game and keep up on all of the happenings. By this time, I had been accepted into graduate school and began telling people that my wife and I would be moving to California. It was hard telling people that we were leaving. Really hard. My mom’s health had leveled out, but we were still uncertain of the future. This was hard as well. It was also hard to contain my excitement as a Tiger fan as you continued to win games into the month of August. I started doing the math and realized that we were probably going to make the playoffs. I am sorry to say, but this math led me to shed the skin of skepticism. I was so excited. I remember going to the cottage up in Baldwin to fish with a couple of the buddies that made up our secret Tigers fan club. I pretended that I was still skeptical, but really, my heart was enthralled for our team. That weekend we fished, threw some cards, drank some beer, and talked Detroit baseball. It was a marvelous time. We couldn’t wait to potentially be watching Tiger baseball in October. Around that same time my wife and I were packing boxes. Bubble wrap, cardboard, and tape enveloped our lives. We were making rental truck plans to move across the country, we were attending good bye parties (which also included my sister and saying good bye to her moving to the Dominican Republic at the same time my wife and I were moving), I had best man responsibilities as my best buddy was getting married, and life seemed so uncertain. We welcomed this uncertainty as our baseball season also became uncertain. We started losing games. It was crazy. We began to question the division, and then we began to even question the playoffs. This didn’t last long as the White Sox fell back and we knew that the play offs were a certainty. It also looked like the division would also be ours as the Royals were coming into town. What the **** happened that weekend? By the third game, I was watching in Los Angeles through the internet, and we had all the momentum. Inge hit a bomb, tears, literally fell from my eyes as we were going to win the division, but it fell foul. And we lost the **** game. I was pissed. I could not believe that we had just been swept by the flipping Kansas City Royals and had lost the division. I thought that the season was ruined. We were now going to go to have to play the Yankees in the first round, and this dream of a season was going to be over before we knew it. I am sorry for losing hope. We were now settled in California. My wife and I both had jobs and classes had begun. We had said our goodbyes, and we were now saying hello to new friends and to a new place. The community of friends had grown back in Michigan, even with my absence, and there was now a large group of people that text messaged, e-mailed and talked on the phone a regular basis about the playoffs. Included in this group was also my brother in law from Texas. It was such a pleasure to connect with him on a regular basis over these games. Thank you for providing space for this to happen. At this time my mom had a big MRI coming up and we were praying for the best. We continued to pray for healing. We lost game one, but as I watch from a local pub, while studying one of the 18 books that I had to know for grad school, we won game two. And then went on beautiful streak of playing beautiful baseball. Winning seven games in a row. My phone would be blowing up with text messages while in class and my piers would constantly laugh at me, I’m sure thinking that I was some kind of freak. (Representing Michigan well!) And then Maglio’s home run. Unbelievable. And now we found ourselves in the World Series. It was over a conversation with my best friend where he asked, “So are you coming to the World Series or what?” The thought really had not crossed my mind, but through some supportive conversation with by wife, she convinced me to go. (She is an incredible woman…) While we had clicked our mouse like crazy at 10 AM on Monday morning before the series, we were not one of the lucky ones to get tickets. (By the way, this ticket system that we have is messed up. I will cry injustice here.) We didn’t get tickets, but I flew home anyway. I knew that I needed to be with these people that had experienced this unusual connection through the “magic” of the Detroit Tigers. I took the red eye on Thursday night to get home for one of the weekend games. My dad and I cheered as we counted down the seconds on Ebay. Nobody overbid us and we were going to game two on Sunday night! I tried to give him the money for my ticket, but he made me promise that if the tigers ever return to world series, that I would have to pay and take him and his grandson to the game. I hope that I have to pay for those tickets one day. So my father and I went. We cheered. We ate hot dogs and drank 8 dollar beers. We won and we danced. Like a couple of fat white guys, we danced. And then we lost. And then my mom found out that her brain was healed. And then we lost again. And my brother in law and I talked. And then we lost again. As the Cardinals opened bottles of champagne, I, sitting in my overpriced, 500 square foot apartment in Los Angeles, open one more beer to celebrate you, the 2006 Detroit Tigers. I guess the point behind me writing you this letter is to say thank you. Thank you for your story this year and how it intertwined with my story. My wife and I have been through so much and you have given us a template in which to relate, even through our stuff. I feel like we all know that baseball is more than three outs and nine innings. It is about hope and surprise and tears and laughter and pain and winning and losing and home runs going foul and broken bat base hits and errors and more errors and relationships and long hair and rain and cold and warmth and time and timelessness and beauty and finally, baseball is about the absorption of life. Baseball is about life and celebrating all of the wonderful intricacies behind the mystery of what is really going on around us. Thank you, Detroit Tigers, for giving us the space to more fully celebrate this transcendent thing that we are all intertwined in. Thank you for giving us the space to celebrate life. Nice post. You reminded me of when Inge blasted that pitch and all I keep remembering is Omar Infante jumping up to straddle the dugout fence with anticipation. And then the ball went foul and Tiger Nation sagged back into its collective easy chair. That heartbreak made Magglio’s homerun that much sweeter. By the way, did you get a glimpse of the lonely Huston Street as he swallowed what had just happened? Now we know how he felt. That’s baseball. Only 155 days until Opening Day! Why are you agreeing with a Leyland comment, earlier according to you he didnt know what he was doing. Its not about self esteem its about not being a sore loser but obviously you are. Kenny couldnt pitch 3 games in a row, SO get off his nuts! Sounds like you just like to complain. Theres a really terrible team in detroit that you would have alot to complain about. Go watch the lions play and Shut the f–k up!!! Joehalstead and Baldangry…thanks for the posts…. You are a typical sox fan…you are the reason so many people feel the white sox have little class …that and the fact that your manager is a loud mouth jerk, your catcher is a guy that even his own teammates hate and your closer looks like he needs to lay off the twinkies…..
Also, the last time I saw the sox playing I heard the distinct sound of them choking as they went down the toilet…..
by the way your team is no longer world champions…. will you please coach the tigers next year…you know it all…maybe you could be like the classless thug ozzie guillen and berate your players in the dugout cause they didnt throw at a guy…or call newspaper reporters out mano a mano…thats what we need in detroit…a gutterball low down sleazebag baseball club..at least we’d be manly men!!!!! Try to separate your politics from baseball for a moment. Jim Leyland was not protecting anyone’s feelings. He was giving the next pitcher in the rotation his chance to excel. More accurately, he was DEMANDING Verlander’s very best because it was Verlander’s turn to produce. Every player needs to know that their absolute best is expected of them at all times. This is the only way Verlander will learn to trust his 2nd and third best pitches when he really needs them to fool a batter. Trust me- great athletes, more than anyone, are aleady in touch with their “inner selves”, since you brought it up. They are, literally, high-precision machines both mentally and physically. Your argument will always arrive at the same dead-end, anyway, and that dead-end is this: someone other than Rogers still has to get on that mound and face the Cardinals, whether Rogers pitches Game 5 or not. Obviously, our youngsters were not ready to learn from Kenny’s killer instinct, as we saw in Game 3 (the day after Rogers stymied the Cards). That suggests that Rogers was no more likely to spark a winning streak than any other in the rotation. So, don’t fall for this naive notion that all we had to do is let Rogers rally the troops in Gm 5 and suddenly all of the errors would stop and Verlander would pitch a shutout and Pudge would hit two homeruns. Rogers did all the rallying he could do on Sunday and his younger colleagues just weren’t ready to answer the call, hence all the walks and pitcher errors. So, you assume way too much. NO one was coddling Verlander or anyone else. Verlander was put on the spot in a must-win game. Does that qualify as coddling? I hope you are not a boss of anyone at your job because you do not understand the concept of professional development. Not that Verlander was not yet qualified; he was on the rotation for a reason. But it was his turn to carry his team and he simply performed in an average way. It happens. Leyland knew that it was rubbish to think that he wouldn’t eventually have to expect his youngsters to produce. Don’t you get that? If your argument has any merit, than Weaver should not have pitched in Game 5. In fact, Reyes should have pitched, since he posted the only shutout (and he did so quite easily). Instead, La Russa went with a pitcher that gave up 10 or 11 hits on Sunday. Just like Verlander, Weaver was expected to produce. Bottom line. So, unless you can convince the Tigers to clone Kenny Rogers four times, just give it up already. TIGERS FANS- whaddya say we stop talking to this guy? Sheesh. punisher… theres this button just below the L its called a period it looks like this . Why couldn’t Rodgers pitch one game in a row-you schlemiel? ***** right I’m a sore loser-and how do you think Verlander feels NOW, putz? I’m still mad as **** about Darrel Evans getting picked off third base in 1987. I take LOSING bad. Maybe I should join some sort of a “positive energy”group,or better yet, call Dr.Laura. And what is wrong with a dustoff pitch,taking out an infielder during a double play,bowling over a catcher,other than upsetting the fans? Okay, the Tigers need one more high-powered lefty. SO- who do we get, and more importantly, which position do we put him in without displacing a great player? What do you guys think? Is Matt Stairs our short term answer? If so, how does my boy Marcus Thames get his playing time? Let’s argue like its March hahaha. First of all, Verlander dosen’t need to find out if he can work out the curve and the offspeed pitches, in the WORLD SERIES, when the team is down three games!!! i got nothing but love for ya! Well it defiantely wont be Dimitri making a return. Haha Frank thomas is becoming a fossil so unless a trade comes along I would say stairs or casey for now. But more importantly our pitching depth. Find a repalcement for grilli, ledezma, and Fargin Rodney! yes, and by the way, nothing is wrong with taking a dude out. In fact, since Marcus Thames blasted the White Sox shortstop, we’ve been doing it ever since (Polanco did it in the ALCS). Plus, I watched Bonderman throw right under Rolen’s chin and Pudge pointed as if to say, “that’s right, brush his *** back!” Tigers are hard-nosed for sure. I LIKE Fernando! Don’t trash Fernando! 🙂 He does walk people, but that can be fixed. He averages nearly two strikeouts per inning (like Zoom Zoom). Give Grilli and Wil a little time- even the biased Fox announcers like ’em. (Plus, even though we would all love to have awesome middle relief, pitching is so short in MLB that Grilli and Ledez are as good as they come, unless the draft starts producing again). You are right, Frank Thomas IS a fossil… and we do not need Barry Bonds. Let San Fran enjoy his rise to the Home Run throne. I like Stairs but he seems like a strikeout candidate (Inge and Granderson do that enough haha). Papi for perez? I will drive him to boston myself! Oh man, don’t tease like that. Neifi Perez for Big Papi? I just cannot picture that. I would settle for a few prospects just to get Neifi out of Infante’s way! Maybe I am too picky, but it bothers me that Papi really doesn’t even offer solid 1st base duty. I hate a DH that cannot even play 1st. did you hear jones is coming back next year? Papi could not only not play he could take every other day off and I’d still take em!!!!! yes, good thing. Good ole Jonesie… I sometimes wonder where his success comes from… he pitches to contact and throws maybe one off speed pitch per inning. Yet, he gets pop ups and grounders like crazy! I definitely think Rodney is better than German (except Rodney walks almost as many batters as German). I would give Fernando one year to get the BBs down and go from there. Big Papi… still thinking about that… man, the Tigers have so much talent that they have little room for… hopefully Clevlen hangs on long enough for Maggs to retire. Nobody has hated what has been going on in Detroit the last few years any more than me. Seeing them out of contention by May most of the time, and with no hope for the future in sight. And none of you has enjoyed this ride any more than me. I didn’t watch the last inning of #5. I told my kid to call if they won, he still hasn’t called. In case anyone hasn’t noticed, the hottest players make the difference in a short series, not always the best. Should we try to get A-Rod, Giambi, other players from the mighty New York Twinkies, and their stellar post season records? This lineup got us to the WORLD SERIES,Game five! if clevlen is as good as he sowed this year he’ll be hard to hang on to in the minors…. charles your posts are becoming full of mixed messages….are you coming around to meaningful discussion or have the sedatives begun to kick in? you are right- but I don’t think Clevlen is on waivers or else he’d be gone by now, right? I think he could steal Gomez’s job (even though that would make our leftie situation worse). Good point, but in April, I will go for the long resume every time. If we get Giambi, the first round of drinks is on me! I will take Giambi and love it! Heck, we took Stairs, and Giambi can’t be a step down, right? maybe we could get palmero and conseco too!!! and bring sosa and big mac out of retirement!!!! grind, you trying to build the All-Steriods team or something? I forgave Giambi cause he just quietly quit doin it… the others got mad and kept lying lol. as well as garth brooks…..
laaaaidies and gentleman welcome to HGH park for todays contest between the tampa bay devil rays and yooooour detroit balco’s!!!!!! wasnt it delmon young that threw the bat?? oh YEAH, it was Dmitri’s lil bro huh! Well, we need him then! whaaaaaaat charles when did I dispute that???? hahaha…. i know it was wrong, but the way that umpire jumped was just too funny! Hey, SOMEONE is drawing a paycheck and never getting healthy enough to pitch! I move that we fire Troy Percival…send him back to Anaheim. not as funny as my favorite baseball blooper…. I’m glad someone brought up Kirk Gibson. Now there’s a person who took senseless losses in stride. Same with Price, Northrup, Kaline, Martin, etc./etc. So, Zach Miner and Mike Maroth are going to fight it out for spot number 5 this March.. who wins? I am picking Miner to pull out an upset. ooops I said I was gonna ignore bleckner and take the ghandi way out didnt I…screw ghandi!!!!!! yeah, Pericval did a good job scouting… give him 400 grand and keep his as a scout (not that he would want that if he gets healthy). We have so many pitching prospects floating around, I don’t know how they manage it all. Ever see the 40 man roster? amazing. I’d like to see Miller some more…. I think percival was scouting other teams lineups in regards to how to pitch to them…. This has got to be Maroth’s year. He’s had so many setbacks… it’s this March or possibly never. It could be hard to get cellar teams to give up any good starters. The Nationals wanted Bonderman or Verlander, for goodness sake! We shall see Miller this spring, you wait and see. 25 scoreless innings, five days rest, almost unhittable-take a seat, we’re going to think about the future now, Kenny! Problbly won’t get ths start Opening Day, either. 25 scoreless innings, five days rest, almost unhittable-take a seat, we’re going to think about the future now, Kenny! Problbly won’t get the start Opening Day, either. No, Kenny gets the start, no question, unless he gets hurt. I am just curious if Miller might become a starter someday, and if Miner can get his off speed stuff back in time to give Maroth a challenge…. psssst ….hey everyone lets pretend we dont hear charles…dont tell him though…..
Zito would be sweet… but he’d break the bank. We need cheap labor lol. Hence Miner and Miller. Come on you are talking about illich here! The dude is loaded! What’s with all the drug/alcohol/glue comments? You sound well versed in this area. guys if we each buy 100 pizza pizzas a day for the next four months maybe illich can afford more players…. You remind me of muself, when I was your age. and if we each buy 20 tickets to every red wings game he definitely can afford more!!!!! I just bought three lowers to two games for my brother, dad and I….glad they gave me that home equity loan!!!!! a. you get a second mortgage for game tickets. and…..you stay up all night blogging about the tigers! Every fifth game for Rodgers will be fine, thank you. good night I better go before I’m single and thus homeless…. Yea I have to work at 8! I hope you appreciate this Nate! I guess Ritalin makes some people sleepy! OK, after having a day to digest it all, I want to say this: If I’m sad about anything, it’s that April seems so far away. My husband and I are already talking about making a trip down from Booneyville, Mich. to come see you guys next year. I only hope that there will be many familiar faces on the field. Enjoy your well deserved break. We’ll be looking forward to next year! It was a magical season for you guys as well as every Tigers fan there is. I cannot wait until next season! Well done, Nate! Well done! Congrats to all of the Detroit Tigers!! Thanks for bringing baseball back to Detroit! Go Get ‘EM Tigers in “07”!!!!!!!!! Hey Nate…Just to let you know that we are SO proud of all you Tigers! We’ve had a wonderful time watching every game; yes, with our Tiger hats, T shirts, and bracelets on. It’s been a terrific season, in spite of the disappointment at the WS, but we can’t wait to see you play again next season! Hope your time off this winter will really help you, and the team bring us another great summer of ’07 ! congrats on great season nate i have a feeling next year we will get them and win the whole thing thank all of your teammates for such a memorable season. I agree it is a time to reflect. I believe sometimes it takes experiencing loss to see what’s really important. As a new fan of the Tigers and as a new fan to baseball in general, what is most important to me is how well the team played througout the season. As some of the other bloggers have said, this team and this season has left me with lifelong memories I will cherish. It was simply magical to see you how you beat the Yankee’s with such grace and style. Thank you and the rest of the Tigers for making me a believer. My husband, a lifelong Tigers’ fan thanks you, too. It’s now one more thing we share together. I wish you and the team a restful, reflective off-season and we can’t wait to see you next April. Thanks again for the memories and the restored sense of pride we have in the ball club and the city. The tears of joy outweigh the tears of sadness by a ton! I have been a season ticket holder for the last 4 years and have seen rock bottom. I can’t thank you guys enough for the joy that you have brought us all year. You have made this whole state come together like one big happy family, including you guys. The way that you all celebrated with us will be a memory that we will never forget. We’ve never been so appreciated by another team. I’ve never high fived so many people in a life time compared to the unknowns that I have high fived this past month alone! Keep wearing that English D with pride because we will all be there next year to embrace you and appreciate your accomplishments. I know I will be there on opening day waving my playoff towel with pride!! Keep your heads up and come out there playing with a mission!! Warnesn, wonderful post. It shows how everyday life goes on around sports, intertwines memories of events near or far with our families, jobs, etc. I’d like to think that the congratulatory and “thank you” posts represent the true Tiger and Cardinal fans. For Nate and the Tigers: I remember watching on a night in September, 1967, when the Tigers needed to win two games of a doubleheader against the then California Angels, and in the ninth inning, **** McAuliffe hit into a game ending double play, the only one he hit into all year. It was the end of one nearly magical season, attempting to get the American League pennant. The Red Sox played the Cardinals, and lost. The Tigers came back with a vengeance in 1968, and started my lifelong passion with baseball, then later all other pro sports. As a girl growing up in Detroit, then into my adulthood, sports has become my selfish, not so dirty little secret. I’m passionate about my teams. My own kids have been able to attend Tiger games, and this year the two best gifts we saw in person were the 6-0 win against the Yankees, with “Ken-ny Ken-ny” chants in the stands, and the Magical Magglio homer to beat the A’s. I didn’t even try to get tickets to the World Series, because nothing would top what we saw in person those two nights. It’s easy to let the disappointing end to the 2006 season dull the glorious feelings we all shared for 7 months. With surprise and wonderment we saw the “Skip” weave his magic over a team and a city that was starved for redemption. As many others have said during the year, baseball ties family memories together, grandparent to grandchild, generation to generation. Every Tiger player, every member of the organization, can take pride in the year we have witnessed. Every game there was a different hero, and if we lost, there was always tomorrow. With “tomorrow” now meaning February, in Lakeland, we can reflect on the hopeful beginnings of a new era in Detroit Tiger history. The saddest part as a long time fan of sports is that this team will change, and players we are such fans of now may be gone. Sports is a passion to some of us, but in the end, it is a business. Magglio watched in pain as the White Sox won last year without him, and he made fabulous memories for us when he hit that homer. I don’t even want to think about who won’t be here next year, because it hurts. The team that takes the field in April will be different. There’s not a player we won’t miss, because this became “our team”. This October, Cinderella didn’t wear blue, she wore red. It was a storybook season, and the good news is that it’s only “The End” for now, because April starts a new season. I think that’s why baseball has a special place in the hearts of sports fans. It follows the seasons the way the life cycle does…. you start in the spring making plans, getting dirty, making sure the seeds are well planted. You tend to it all spring and summer, watching it grow, adding to the soil whatever is missing, making sure you protect them when the conditions change, then in the fall rejoicing when you can see the blooming, the fruits of your labors. To all the Tigers, and their fans, enjoy the winter, the holidays, with your families and friends. We had a wonderful, unexpected ride, and regardless of where we end up next year, or in any of the years to come, it won’t be forgotten. We live for this. Nate, I’m sure you share these replies with the team and you should all realize by reading them that not winning the World Series this year did not break our hearts but quite the opposite: I cried when you guys won Game 2 against the Yanks and cheered with dear friends when you swept the A’s … I was there when you beat the Yanks and at the opener against the A’s … I will be buying season tickets in 07. This team of Tigers is my absolute favorite, so special and just getting started. Be proud of achieving success with plain hard work and good craftsmanship. The Tigers were a pleasure to watch and I rarely missed a game on TV. Thank you to all the Tigers and my hat is off to the Cards, who really fought hard and even back when the Tigers swept them in the regular season, showed that they were a tough team. Hope that gives you a smile, Nate, and thanks for being such a powerful part of the Tiger spirit. Brandon, Placido, Curtis, Craig, Carlos, Ivan, Marcus, Sean, Kenny, Justin, Todd, Jeremy, Vance, Magglio, Jim, Joel, Chris, Omar and anyone I missed, my apologies. well said everyone…glad to see a majority of positive, class fans weighing in! I know even the naysayers will come around by opening day….and if they don’t hey, more seats for us!!!!! The curse of Kenny Rogers. Isnt it kinda funny how the pitching staff made so many errors and seemed to throw the game away for the tigers. All this happened after game two(which was the tigers only win). And we all know what happened at game 2. The game that Kenny Rogers CHEATED. Not just that game but the game against the yankees and the A’s. Will i guess in this case the saying is true. “Cheaters never win” ITs to bad he did that because i was a fan of the tigers going all the way but after game 2 i was routing for the cards to put an end to this tainted post season. I have this arguement with every one i talked too. The common response is “everybody puts pine tar(excuse me, i meen really sicky mud) on there hands”. Even if thats true its still illegal and kenny rogers is the only one that was cought. Not only was he cought but after reviewing the game agianst the yanks and tha A’s he had the same “mud” there also. What a year! Thanks so much for a fun, exciting and INCREDIBLE season! We couldn’t really have wished for more. It was so nice to have winning baseball back in Detroit and the postseason run was such a nice bonus. Even though the finish wasn’t what we had all hoped for, I know we’re all hoping for the same next season (with the big win at the end). In a year of what could have been huge for Detroit sports (if the Pistons and Red Wings had done what many thought they would have; and the Shock winning their title), a huge THANKS to the Tigers for being the team to bring an enormous amount of pride back to Detroit. I love seeing all the Tigers gear around the state (bandwagon fans or not) and I’m sure we’ll be seeing even more now. Thanks for making the state of Michigan VERY PROUD! This group of Tigers is a CLASS ACT! Have a relaxing winter break. Can’t wait for April 2! Hope to be there! I’m glad you rooted for the cards…please do so again next year. the Tigers DO NOT need fans like you!! and I don’t know about anyone else but I’m about to go postal if I hear another word about the BIIIIIIG controversy…..
jns013 – why do you think, in the biggest, most watched baseball game of the year, viewed by millions and hawked over with even more scrutiny by officials than any other event in the baseball season, would Kenny Ridgers risk everything to put something on his hand that was illegal??? Especially since it was so noticable. Do you really think **any** player would be so brazen and risk everything to cheat so obviously??? No, if it were hidden in his underwear and he yanked his pants before each pitch, or it was on the underside of his shoe and he touched his heel before each pitch, then maybe, just maybe, I would believe he cheated. But not with it being plain as day on his hand for all the world to see and discover. It is not a big controversy, i was not cheating – it was nothing. People need to get over it. Yea buddy Im getting sick of hearing it too. Rogers is a crafty veteran in the league. People are just pissed because he came to Detroit and was acomplishing the impossible. Im not really bummed about not winning it all. When the season started they were hoping to hit .500 baseball. Well they did that and more. Go ahead root on your cards, and sox, They will need all the help they can get when 07 starts up. It was like the whole season was a dream–an incredible dream. I’m not going to say I wasn’t disappointed that my Tigers didn’t snag the big WR, but that doesn’t take away from the amazing season you guys have had. To me, beating those **** Yankees was THE World Series. I think everyone agrees that you just walking all over the most expensive team in the league was perhaps the greatest accompish in the MLB this season. Now, sights are set on the WR next year. After all, once you’ve done it all, what other challenge is there? I’ll be watching you guys from Toronto, and cheering all of you on. Now I’ll just dream on and wake up again when April comes! I just wanted to say thanks to all of the Tiger players for providing us fans with such a great year of baseball. My ten year old son loves all of his Tigers. And you guys were so kind to him and other kids thru the year by taking the time to sign autographs for them. My son really sees you guys as role models. It gives kids something to strive for…to always give it your best effort. While playing Little League baseball my son quite often imitates mannerisms of Tiger players while batting. He does a pretty good job of copying them. Most often he imitates Inge,Polanco, and Infante. We were able to get tickets to Game #2 of the WS. Prior to the game my son got an autograph from Craig Monroe and then Craig hit a homer his 1st at bat, so that autographed ball really means alot to him. That WS game was a first for all of us… Wow! I’m glad we went. It was really something to see in person. The Tiger pitching staff had a great year and I see it to be even better next year. Thanks for all you do on and off the field. ….ok, gotta go … I have to get back to my “half full” glass of orange juice! see gbos post if you dont see the upside right now!!!! !’thanks gbos…more proof of what thios team and this game are REALLY all about! It’s not about our little egos of thinking we know better or cause we’ve rooted for them they owe us any more than the amazing year they gave us…The question is did this team leave it all out on the field and conduct themselves with pride and class…if anyone tries to say no to that look deep in your heart…what is the real reason for your anger? Corked bats, loaded balls and tilted chalk lines and all the rest are not cheating, its part of baseball-the way its always been played. And always will be played. And to end without giving your ace a shot=Cards 4-Tigers 1. Has anyone seen Dr. Feelgood? Nate, I have faith that you and your fellow teamates will be back in the world series next year. You guys have so much young talent. You are a young pitcher and you will continue to improve and become a good pitcher. If you dont mind I would love that you send me some 2007 season tickets. You **** Nate, I hope that you never pitch again. You are just a red headed fool who doesnt know how to pitch. I think you should give season tickets to jacob.murphy@sbcglobal.net. this is absolutely the last time I will respond to your litany…. It must be really starting to stink over there ’cause that dead horse you’re beating must be starting to decompose!!!!!! over and out buddy I may post here again but it WILL NOT be in response to you!!! And I haven’t asked for your responses, either. By all means internalize them. BTW,Mr. Roberts, Kudos to you and all the players, I hope none of you leave, with the free agents, they can buy a bat or two, and wait until the season is underway to see if and what changes need to be made. Why anyone would want to “fix” a team that won 103 total games is beyond me, but I’m a fan, not an expert. Hey Kurtz-do they play baseball on your home world? ah the ignorant one is back….if they didnt make enough money for their families they should have found real jobs!! they werent at gunpoint were they…thats a lame *** excuse for cheating!! Also, if your organization was so ashamed of the way comisky treated his players it was a great idea to play in a new park named after him years later!!!!! Quite a legacy to carry forward…that shows the intelligence and integrity of the white sox organization. I can see how bitter you are for having to watch your team go down the toilet this year. get use to it! Thanks for representing white sox fans so well. You are proving everything I’ve said about that team and it’s fans! Just a short note to thank you and the rest of the guys for a summer to remember…the fun and excitement will never be forgotten. Looking forward to next year. Hey Kurt you seem to make alot of comments about ***********, Is that the inner you that is trying to break out?? Before you start blogging on a site maybe you should learn how to type and spell. Ofcourse of you are from chicago that explains most of your ignorance. Please dont listen to the people who are disrepecting you and the tigers. They are jealous of us. They say you ****, but thats not true. You tigers did a heck of a job this year and all of detroit appreciates it. You made us roar this year, thank you. you brought back the baseball spirit in detroit. Well it never left. you been so amazing this year. I used to never really be interested this year, but my dad got me watching baseball. I thank him for that and now i really like it. Well i always loved the tigers but i was not interested in watching baseball ever. My dad got me hooked on it and now im a freeeeak!!! Its so surprising. Baseball is all i practically think about now. I go to school with the tigers on my mind i write GO Tigers all over my arm with pen, yes i know its not good to but what the heck. When i hear the name brandon i think of brandon inge or a first name of a tiger ill think of that player. EVERY and i mean EVERY morning i wake up with the tigers on my mind. Ill go to the bathroom,and ill say to myself GO TIGERS! its so weird though. But i love the tigers. I also love bubblegum to. I chew gum whenever the game comes on in order of gum time. Gum time is my favorite part of watching the tigers besides watching you tigers do so well and seeing you. This summer was the best summer of my life. I would sit and sit and sit and then at 6:30pm i would put it on channel 13 (FSN) here in southwest detroit and watch the pregame show. then right at 7:00pm the game would come on. I love the two announcers for FSN. Mario Impemba and Rod Allen. I cant wait to see them next summer along with you amazing tigers!. Well this summer was the most unforgetable summer of my life. I did go to comerica for one of the games. You played the twins and you lost 2-4 but you still were amazing. Matter of fact, it was the game where the Exteme Makeover: Home Edition team was there. Nate, im sure you remember that game. But Thanks for an unforgettable summer of mounted memories that us tiger fans will NEVER forget. Good job with the world series. Aint no losing game letting us down. We still stand strong,and there is a whole year ahead. I love you sooo much nate robertson,and all the other players of the tigers AND jim leyland, Thanks for this year. by me saying i used to never really interested this year, i meant that i never really used to be interested in baseball. I was ALWAYS interested this year since the first two game that was when i got addicted. But before this year i never really was interested in baseball but i always did love my tigers and i never forgot you tigers at all. Im having Tiger withdrawls. NOw, that the season in over with. Im missing you tigers so much!. I love you guys soo much! Please keep doing these blogs because if you dont we will miss talking to you!!! Please!!!! Good luck with next season! I echo what most of your fans are saying about your talent and hard work this season. You and your teammates have given us a beautiful gift this summer filled with wonderful memories and the discovery of how baseball is supposed to be played — with pure passion and respect for the game! In my eyes, the Tigers won the World Series! The end of the season is like saying good-bye to an old friend. Take care of yourself and enjoy your time off. I look forward to following you next season! Don’t forget to lose Perez, as well! Twenty min. after the game was over, I heard Price say Bonds would be available, and maybe the Tigers might consider a deal involving a front line pitcher for him. I think that would be nuts, but what do you think, Halstead? I hope they lose kenny rogers too hes just a big fat cheater…thats what joe morgan tells me anyway! and we all know anything the media says is true!! Rodgers is what is called a “crafty lefthander”. Joe Morgan is what they call an “ex-player”. And picked the New York Tankers in three. Getting rid of a top rate pitcher for Bonds would be a deal with the devil- by top rate, they better mean no one better than Zach Miner or Mike Maroth. They could afford losing one of those two (preferably Maroth, and my wife would be surprised to hear me say that, but Maroth has no power and is a tepid version of K.R. while Miner has some zip and a promising slider). I am surprised to hear that Joe Morgan said something like that… he is normally a bit more wise about rushing to an opinion. I wouldn’t mind seeing Bonds chase Hank A. at Comerica, though, if all we have to do is ship Mike Maroth to S.F. well, ain’t i the dumb-***…. isn’t Barry a free agent? We don’t need to trade ANY pitcher away for him.. just offer him the cash he needs and that’s that. So, do you think Maroth is done? I think the gate will do fine without Bonds. The issue for me is how much trouble will Bonds cause? Will the locker room be split in half to create his own personal lounge? But maybe I-Rod will put 20-30 pounds on, and start hitting like he used to. Do you know who else is avail.? I heard about Rich Aurelia, Alphonso Soriano (and just where would they put him, unless they wanna bench Maggs or Monroe? They wouldn’t bench Granderson because that would defeat the purpose of more lefties), and Garciaparra, whom we do not need and would not give us anything we don’t already have with Infante). Other than that, the rest so far are pitchers. Does anyone know of anyone else? I DO think Maroth could be done, unless he has one heck of a spring. Whats the story about the guy just signed in the minors, I forget his name, an outfielder, I believe? Yeah, Maroth didn’t do a thing when he came back this year. The big problem we have here, is having to have a team to get us to the postseason, and then keep hitting! Some guys don’t hit then and some that nobody heard of get series MVP. New York choked, or were overpowered. Same with St. Louis two years ago. Oakland- same thing. A-Rod, I-Rod, Giambi, Thomas, and all the rest can stop hitting in a second. yes, the slumps afflict the most talented it seems. About that outfielder- you must be talking about Brent Clevlen- REALLY good player. If our sought after leftie doesn’t take an outfield spot, I could see Clevlen being Magglio’s successor someday. Thanks for your blog work. It really helps shed light on what it might be like from within the organization. Went to a number of games this year and you made us all proud. After the loss in St. Louis, I made sure my twin boys (16 months old) wore their tiger caps and we went out for dim sum. Everyone in the restaurant smiled when they saw the boys in their caps. You are heroes in Windsor too. Can’t wait until next season. Bless You Boys…. No, its not Clevlen. Its some guy that hit .340 or something, and young, like Miller. I haven’t heard much about bringing him up real soon, maybe going to double-A in the spring. I don’t know if he was a no. 1 pick or what. Remember how Higgenson hit in front of Gonzales, who brought a good reputation to Detriot, and not much else? I think the same would make Polanco really perform well. nate, i hope you tigers dont lose any players. these people dont know what theyre talking about. dont listen to them. To tigers fans you are the best baseball club in america no matter what. Well good luck next season and i love you all! Nate, please tell magglio dont cut hus hair we love it toooo much! its so cute! Nate, as I was out driving around on Sunday, I just had to honk at each person I saw with their Tigers car flag still blowing proudly in the wind. And there I was with my Tigers shirt on, my Tigers hat sitting on my dashboard and my Tigers bumperstickers on my rear window. You guys had an incredible season and we the fans loved every minute of it. I feel sorry for the people that only tuned in to watch the Tigers in World Series because they have no idea what they missed. I was watching some of the videos of top plays from this season and it brought tears to my eyes (especially the one where Polanco got hurt). You guys are THE BEST. Leyland is the BEST. I can’t wait for next year. Hey Nate just wanted you to know that being from the Toledo area and having watched most of you guys play for several years we just wanted you to know that here in T town we are very proud to be Tiger fans and we are proud of the way you guys played this year..Ive been a faithfull fan even during the lean years and it means alot to us that you made it as far as you did. Hold your heads high and the fans will always be there for the tigers..
You didn’t win the WS but in my eyes the whole team is a winner. My dad taught me baseball in 1982. I have to say after 1987 I didn’t watch much. And for some reason in May of this year I turned on the TV and you guys were on.From that point on I watched every gameand I only missed one game in the last 3 innings because my mother became ill. Other then that my life revolved around all my Tiger Men.And I enjoyed very much watching every game the rest of the season. I look forward to next year and can’t wait to watch every game. And maybe next year I will have better luck in getting some tickets. Good luck next year can’t wait till APRIL 2, 2007!!!! Please tell magglio dont cut his hair! we love it to much!! please!!! Well i wanted to thank you tigers again for an UNFORGETABLE season. You made us roar even more and you shocked all of baseball which makes you and the fans proud. Please keep these blogs up and running we dont want you to leave us,we will miss you so much soo please keep doing these.I cant wait till april 2!, im so bored without watching you guys im missing you everday now! what am i gonna do all winter? I love you nate and all the other tigers player and good luck with next season! I am so proud of you and the entire Detroit Tigers team and organization. I was sad to see it end the way it did, but I know that the team is going to be competitive for a long time now. It was an amazing season and I’m so glad I had the opportunity to follow the team and witness history. So many great moments that will remain unforgettable in my heart. I can’t wait for next year! Have a good off season with your family and friends. I look forward to watching you pitch next year and look forward to another great run at a World Championship! Don’t stop believin’. Just wanted to say thanks for a great season. I have been a Tiger fan for many years and just love to watch you guys play. It would have been great to watch a couple of more games, I’m just going to have to wait until April. You guys have accomplished something that can never be taken away from you – you brought baseball back to life in this area. I am from Windsor and cannot believe the excitement that has evolved from this awesome season. Everyone is talking baseball and already looking toward the spring. WHO’S MY TIGER ? ? ? ALL OF THEM ! ! ! Saturday night was kinda boring with no baseball to watch! This has been the most exciting sports seasons I can remember! Thanks for bringing baseball back to Detroit!!! Beating the $200 Million Dollars Yankees was like Christmas in October. That was so exciting. I felt like we won the World Series then! I have been on sleep deprivation for about a month now. Staying up till 12:30 am and then getting up at 5:30 am to go to work. UGH. But it was worth every minute!!! Words cannot express the joy you have brought to our lives. Michigan and Detroit needed this right now and we are so proud of you. So many exciting memories. I can’t wait for next year! Winning next year will now be even sweeter!!! Thanks Nate and all the Tigers! Six months until April!!!!! The worst part about October is the baseball season is officially over for all fans until spring training of the next year. You’re right though – it is time to reflect and this year we can all reflect on one of the most memorable seasons for the Detroit Tigers organization. I’m sure I speak for many fans when I say this has been a heartwarming, exciting and emotional year and although it was difficult to see our beloved Tigers struggle in the World Series the entire season and post-season has us busting out of our replica-wear with pride, joy and anticipation for 2007. There will be great expectations for next year but a wonderful foundation of pride for the Detroit area has been built and can’t be taken away. I already have a few road trips planned to take my family to see some “away” games next year (just like every year) and know I will not be the only group in the “away” crowd proudly wearing the “OED”. You guys have managed to achieve something absolutely incredible this year. As evidence in these posts everyone is looking forward to next year. We are all feeling the Detroit Tigers will field a winner and contender in ’07. I’m sure I speak for all Tigers fans when I say we haven’t been able to truly say or feel that in a loooong time! And it feels pretty darn spiffy!! Once again THANK YOU ALL for one heck of a ride! Hi, Nate & Kirsten! I know that you can’t read all of your posts…I wish I could write every guy on the team…I know every guy doesn’t care. But you do. And so thank you so so so much, Mr. Nate, thank you for all the good times this Summer. You have no idea how much you all meant to us, especially people like me and my son who are not sports fans!! We are only Tigs fans, born & bred (and I mean that literally). The Tigs have been part of my family forever, thick and thin, like Iffy says, just to be at the old ball park was enough, we knew it wasn’t going to be a winning game, it was a necessary Detroit experience, however, like knowing where Hitsville USA is and that you were born at Henry Ford Hospital. Nate, my dad and my son, Morgan, were so close, but my dad died of cancer in October of 2001. When CoPa was being built, several times he drove us around the park and said to us, “My dream, before I die, is to take you two to a game at CoPa”. Well, he did, and it was a beautiful rain-delayed KC game, 3rd base line, we won, and my dad’s dream came true, and I decided to love my new ballpark instead of being bitter and hating that they tried to replace my Tiger Stadium. It brought home to me how important the Tigeys were to my dad AND me. I looked through my old scrapbook back in June and found old programs from 1979, 1980, and even a “Bless You Boys” bumpersticker! It’s on my car now, taped, of course. Nate, it’s all to say, as I’m sure your wife knows, I don’t care that you didn’t get the World Series trophy. I knew, don’t know why, but I just did, that you all would be great this year. And YOU WERE!!! I love you ALL for that. You were extraordinary in that you seemed to be as one, for the first time since I was 12 years old. I mean, I know all of your NAMES!!! And so do my son and husband! You have done your utmost. We ar so proud of you and we hope that you will stay with us FOREVER. Kirsten, my daughter is ten and she is just starting to babysit. So–when you need her, built-in, OK? We live in Plymouth. Nate–remember the Neville Brothers CD that we gave you at the Art Van signing? That’s me and Morgan! You are his Hero. Another intellectual wih glasses! Please come back to the Tigers, we love you and think you are THE Nate the Great. One more post from The Byrd! My dad used to say, “I’m completely neutral: I don’t care who beats the Yankees”. Was that not THE finest moment in MLB this year, people? Game four, we kill ’em 8-3, fellow Tigs fans, really, what could be better than that? No joy surpasses the pure elation of beating the Yanks x3 in the alds, come on! To me and my dearly departed dad, there was not a sweeter moment in life. PURE BLISS, BABY!! awwww why did sean casey have to file free agency???????? i love him so much!! i dont want him to leave!!!! he should sign back to the tigers!!!!!!! the fans love him!!!!!!!!!!! Nate- congrats on a great season! I am your biggest fan! IS IT APRIL YET?!!!!! I am already going NUTS. I have watched every video clip online over and over again. I have watched Ordonez hit that home run so many times my husband is about to delete it from my DVR. Winter *****. I WANT MY BASEBALL TEAM BACK!!!! Congrats to Pudge and Kenny for winning those 2006 Golden Glove awards! Nice they got the recognition they deserve!! Three little boys fell in love with baseball this summer…thank you for that. Hi! I wanted to thank you for making my 6 year old son’s day way back on August 26 in Cleveland. Starting last year, we began going to an away game in the summer.This year, it was in Cleveland and by coincidence, we stayed at the team’s hotel! What a thrill. You were sitting in the hall close to the elevator talking on your phone and I motioned to you to see if we could get your autograph. We didn’t want to interrupt so I began to say never mind, you are on the phone, but you waved us over and signed my son’s hat and one for my other son. That was a huge deal for him! Thanks so much. I think we watched every home game on t.v. this year and went to about 6 games..thanks for a fun and exciting year. We can’t wait until April! Pretty sure i got the biggest smile of the day outta you! Management: Don’t trade Ledezma for Sheffield!!! Sign Casey!!! dont trade ledezma at all.My dad knew ledezmas mom. her name was cindy. she died though. my dad told me he met wilfredo one time. He told me how his mom cindy sent him to college. but dont trade ledezma hes a good player. I know its not your authority and you dont do the trading but i dont want ledezma to leave. I also want sen casey to resign with the tigers bcuz he is amazing . well i love you nate and all the other tigers and jim leyland! good job this year and i wish you good luck with all the season more to come! Here it is almost Thanksgiving and I’m still having baseball (Tigers) withdrawal! I miss getting to see you guys play every day. I hope you are enjoying a well-deserved rest. Of course, the outcome of the World Series was disappointing, but I have no doubt that you guys were the better team. I truly believe that the long lay-off hurt the Tigers because you were on such a roll. I wish it could have been different, but that’s not how it turned out. Regardless, you guys gave us a wonderful season and so many exciting moments. It was so much fun to be able to watch you guys again and expect you to win. Thanks for a great season; enjoy your off-time. I’m ready for spring training and a new season!!!!!! Take care. Nate, My old man is 91 and he used to thumb from Kalamzoo (where he was born and raised) to Tiger Stadium and then sit in the bleachers for a nickel. I’ve been a Tiger fan my whole life despite being born in New England. We subscribed to the MLB package on Direct tv and saw about 130 games this summer together. Then the playoffs and the Yankees came (we are from Connecticut). Needless to say, this was the best year since 1984 in so many ways. My father still scores each and every game — uses a notebook and a ruler to line off the innings. Thanks for a great, great season. Can’t wait for the opener. Can’t wait to see you in Toledo for the Tigers Fandumonium later on this month. Gum Time is going to take us all the way this year. And congrats for being signed, sealed, and delivered for 2007. I wish you were on the other bus tomorrow as I’ll be in Kalamazoo at WMU for the Caravan visit. Wow, it’s really getting exciting just thinking about the upcoming summer and Spring Training. Take care, Nate. Go Tigers!!!! This season was insane! I absolutely LOVED it! I’m only 15 years old, but I’ve stuck with the Tigers when I REALLY got into baseball in 2003…I decided that the Tigers were my team, not only because I live in Michigan, but because of the sociable teammates. Ever since the 2003 season, I’ve rooted the Tigs on hoping that I’d eventually see the WS come to Detroit…and this year, it happened. Thank you for such a GREAT season! It was so much fun and I look forward to the seasons to come! How exciting that the pitchers and catchers report today for Spring Training. This is a sure sign that us Michiganians are on the verge of defosting from the brutal arctic winter weather we have been having. Sure hope Nate starts blogging again. Maybe even more frequently this year. We never seemed to get enough of him!! Go Tigers! We love you….each and every one of you! Sweetie, if you don’t feel like bloggin this year, we all can deal with it. We’ll always have Gum Time and will be watching you chew us into a rally. If the blog is a distraction for you, the fans understand. You do what’s best for Nate and, please, let’s give him some run support this year. Go Tigers! Disapointment. Not for me-a fan. Every time I think of last year (which is pretty much all of the time-laugh)…just great memories you gave us. So excited that spring training has begun! Nate.. Last year was an incredible season, the team had sweet sucess! I attended game 3 of the ws and it was incredbile. It is great to see how much the team has improved since ’03, and i think last season really brought life to the club and the fans. Just want to wish you luck this season,(being my favorite tiger) it looks to be another great one! Good luck man!